CAPE is home to two different sleds to simulate the forces of a crash for systems and component level testing. Efficient pulse development enables CAPE to duplicate the deceleration from actual vehicle crashes or to accurately meet a wide variety of regulatory standards. With a broad range of capacity, CAPE’s sled testing offers customers an efficient, repeatable and less resource-intensive tool to evaluate their products. 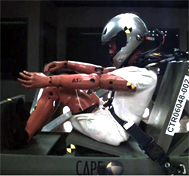 CAPE’s deceleration type sled is used for repeatable testing. Capable of loads up to 8,800 pounds, this sled can be used to test small systems (such as vehicle seats) up to entire vehicles.